When the kids are out of school and the weather is warm, it’s a fantastic opportunity to get your family out of the house to spend some quality time together. The only problem is that sometimes quality time can get pricey when you multiply it by three, four, five or more people. Even a matinee movie for the whole family can break the bank when you start adding in popcorn, drinks and candy. Don’t worry; by getting back to basics and thinking creatively, it’s still possible to plan fun family outings without taking out a second mortgage. Start by checking your local newspaper, newsweekly (those free, independent publications you see around town) or magazine to see what’s happening this week. You’ll be surprised by how often there are free concerts, art exhibits, plays and other events right in your backyard. Take advantage of the chance to try something new (for free). The great outdoors is full of possibilities, and it’s usually free or very affordable to explore. Pack your Frecklebox lunch boxes, some toys and sports equipment and head to a shady spot in the park for an afternoon. For a day trip, find an easy hiking path, pack bag lunches and plenty of water and hit the trail. For a longer stay, spend the weekend camping. 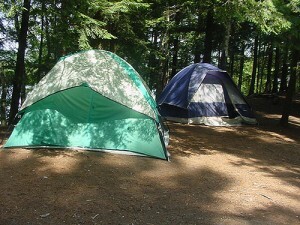 Look up KOA campsites in your area and get ready for a few days of hot dogs, s’mores, campfires and sleeping under the stars. On a scorching summer day, nothing feels better than swimming in cool, refreshing water. Take the kids to the local public pool for an afternoon cool-down. If you live near a beach, a lake or a river, make a day of it and bring inflatable rafts, inner tubes, pails and shovels. Don’t forget the sunscreen! Escape into the quiet, relaxing and often air-conditioned oasis of the nearest public library. You and your children can stock up on great books for summer reading, and you can also time your visit to coincide with a story hour. The kids will love being read exciting tales, and you will get a few minutes of your own to sit back and relax. Research the nearby museums, amusement parks, zoos and aquariums for specials. Many places offer one free or reduced-price day per month, so you can affordably take the whole family (and even a few friends). If you go to a certain place often, consider buying a year-long pass for your family-these tend to save you a lot of money in the long run. You don’t need to spend a ton of money to have a great time! What are your favorite budget family outings?